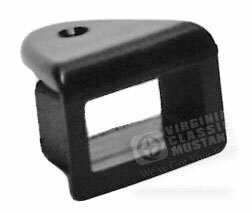 1965 and 1966 Mustang Fastback Rear Seat Latch Guide. Black injection molded plastic just like the originals. This part fits on the side chrome trim of the rear folddown seat. It is often missing or broken.